The more Powerful TUV300 to carry the new mHAWK100 engine, which will deliver a power of 73.5kW (100 Bhp) and best-in-class torque of 240 NM.The new mHAWK100 engine will be available in the top-end variants of the TUV300 – T8 & T8 AMT. Mahindra & Mahindra Ltd. (M&M), India’s leading SUV manufacturer, today announced the launch of a more powerful avatar of the TUV300 with the all new mHAWK100 engine. The new mHAWK100 engine will deliver a power of 73.5kW (100 Bhp) and will be available in the top end variants of T8 & T8 AMT in the TUV300. To be available across Mahindra dealerships pan India with immediate effect, the TUV300 with mHAWK100 engine will be priced at Rs.8.87 lacs (ex-showroom Mumbai for T8 variant*). Along with more power, there is a boost in torque from 230 NM to 240 NM in the TUV300 with the all new mHAWK100 engine, thereby improving acceleration with more pep and torque. The TUV300 is also India’s 1st SUV to offer autoSHIFT Automated Manual Transmission Technology (AMT). The autoSHIFT (AMT) T8 variant has also been upgraded with more power and has been refined for smoother automatic gear shifts and a fatigue-free driving experience. The TUV300 will also offer a more comfortable ride with better cushioned seats in the 2nd row and comes with ISOFIX Child Seat Mounts on the 2nd row seat to ensure safety of the child. At Mahindra it has always been our endeavour to incorporate consumer insights and feedback and hence we are happy to introduce the more powerful TUV300 with the mHawk100 engine. Further the TUV300 AMT T8 variant will offer a more thrilling drive with the upgraded power. With over 25,000 TUV300s on Indian roads, it has emerged as a strong player in its segment. With its all new powerful engine as well as a winning combination of bold true-blue SUV design, premium & elegant interiors, superior driving pleasure and best in class safety, the TUV300 will become an even more compelling value proposition for our customers. Mahindra TUV300 T8 variant is now made available with both mHAWK100 & mHAWK80 engine options. 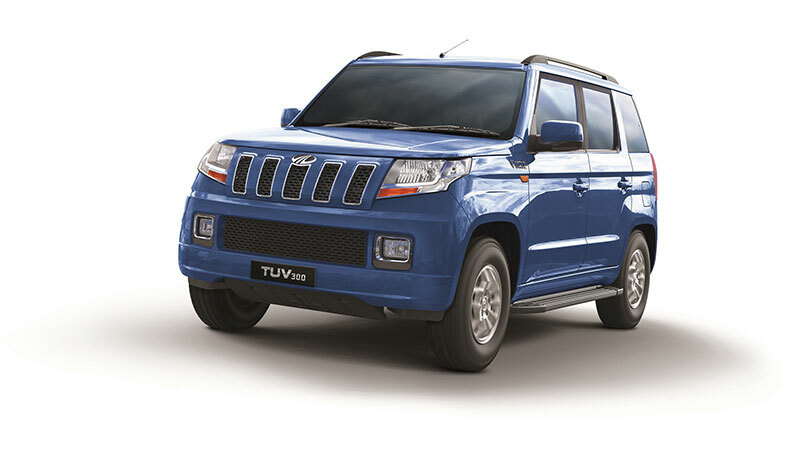 The other variants of TUV300 will continue to be powered by mHAWK80 which delivers a power of 61.5kW (80Bhp). The tough & stylish TUV300 offers peppy performance, at a great price starting from just Rs 7.26 lacs (ex-showroom Mumbai, T4 variant with mHAWK80 engine *). This powerful 100 Bhp Mahindra TUV300 is priced at INR 8.87 lakhs, the new TUV300 would be available at Mahindra dealership across India with immediate effect. Check out Mahindra TUV300 Colors and our review on TUV300.